Before we became Astronauts, NASA wanted to make sure we didn’t have a shady past. The application paperwork was extensive. If we were invited for an interview, we had a background check. When I returned from my week-long job interview at the Johnson Space Center, a neighbor came to see me. It was the beginning of being watched. At NASA, everyone had to attend an annual security briefing. We’d listen for an hour about how spies might approach us and bribe us. 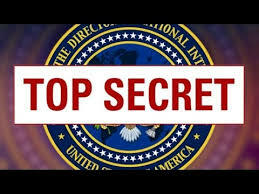 We were warned not to mishandle any classified documents we might come across. There would be penalties for breaking the rules – being fired or put in jail. We had to sign a document that said we had attended the briefing, understood what was said, and agreed to comply. Repeat background checks would be done every two years. Astronauts like me were given a Secret clearance. I took the responsibility seriously but figured I’d never be involved in anything secret. 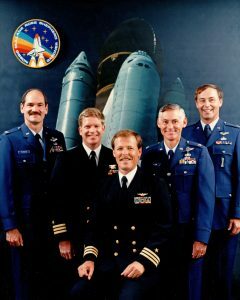 Hoot’s second flight as Commander, STS-27, was the second launch after the Challenger accident. It was a Department of Defense flight. That meant whatever the flight was about was “classified,” and only those people who had Top Secret clearance would work on it. It was maddening that Hoot couldn’t tell me what he would be doing, where he was going when he traveled for training, the exact launch date, and what his mission was about. Luckily his crewmates had great spouses, so I wasn’t alone in my cluelessness. Hoot was secretive for most of 1988. Dinner table conversations were either about my next flight or our family, which was about to add another child in March of 1989. As the possible launch date neared, we were told to pack our bags for a time period when we might go to Cape Canaveral. When we arrived at Florida, we were told approximately when we’d go out to the launch site. It was crazy being ready at a moment’s notice. The flight went well; afterward, the crew went to visit military leaders in Washington, D.C. When he returned home, Hoot told me he had received a medal, but it was a secret one. He couldn’t have it in his possession. What?! Years later, the mission was “declassified,” and we learned that a spy satellite had been taken to space. The crew could only take a few pictures on their flight in case there was something secret in view – like what their payload was, how high they flew, or over what part of the Earth. There were few photos, but there was one Hoot could reveal. He is sitting in the Commander’s seat and behind his head is a roll of tape. Since he couldn’t tell audiences what the “secret” mission was about, he said it was really a flight to test duct tape. Hoot certainly has a sense of humor!! Tell him that his second cousin (me) still has the album he signed. I hope to have you sign it, too! Hoot came here to Pasco County to the County Schools Science Fair. We were “groupies in the eighties and early ninties going to the Cape. I just purchased your book and looking forward to reading it! Dr. Seddon, I have enjoyed finding your blog as much as I have enjoyed your book. As a life-long “space freak,” I find that I can’t get enough of “the real stories.” I enjoy living the life I had hoped to live vicariously through each of you who actually lived it. If you or your husband are ever in the Portland, OR area, I would love to meet you both! Great punch line to a good story! 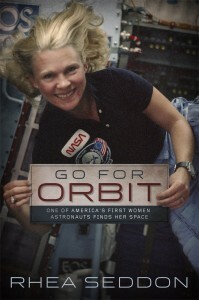 Yours is one of the better astronaut authoured books. 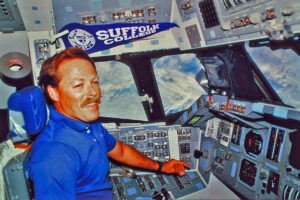 Mr. Gibson’ s article ‘Flying the Space Shuttle ‘ was awesome, please publish his autobiography. I first meet Hoot in Cooperstown, shortly after the 27R mission. He apologized for not being able to talk about that flight. Still have one of the pictures I took of him then.